Apps and web tools for instructors and students at Walters State Community College. According to Wikipedia, Augmented Reality is a live direct or indirect view of a physical, real-world environment where elements are augmented by adding object recognition. Information is manipulated digitally and overlaid so the object becomes more interactive. Flashcards are no longer boring with Octagon 4D+. Created by Octagon Studio, Animal 4D+ is a fast and lightweight app that allows you to scan the printed animal cards and witness how the animals come alive right before your eyes! The Animal 4D+ app brings you a new way of seeing animals in Augmented Reality. This gives you an unforgettable experience and will always leave a smile on the faces of children and adults alike.Animal 4D+ gives you both interesting and informative facts about animals through A to Z such as the Ant, Giraffe, Horse, Elephant and Iguana. With the scan option and using the Animal 4D+ Alphabet cards the animals spring to life. Have a giraffe on the palm of your hand or maybe you’d prefer a lion instead. You can scan a number of cards at once, why not make a zoo out of it. Examine some of these animals up close with the 3D option. This turns that 2D sketch into a 3D moving animation which allows you to spin, turn and zoom in and out of each animal. Print the flash cards. Launch the app, point the camera at the image on each of the cards, and see the intricate augmented reality stories spring to life. Augmented Reality Freedom Stories highlights seldom told African Canadian histories from the era of the Canada/US Underground Railroad including Harriet Tubman's efforts to bring American slaves to freedom in Canada. Primary and secondary documents have been hand-crafted in consultation with community partners into a unique experience that has been approved for use as part of an Ontario primary school curriculum as part of the Breaking the Chains history project. This experience works best on iPhone 4s or later. Images may appear slowly on iPhone 4. Harriet Tubman Institute for Research on the Global Migrations of African Peoples, York University, Toronto, Canada. Founding Director, Paul E. Lovejoy, Ph.D., Distinguished Research Professor and Canada Research Chair in Africa History; Principle investigator, Breaking the Chains. Acting Director, Michele Johnson, Ph.D.
Senior Research Associate and Project Manager, Karolyn Smardz Frost, Ph.D.
Research Collaborators:, Mark Affum, Rosa Berdejo-Williams, Diana Braithwaite, Hilary Dawson, Nikola Dimitrijevic, Kendra Ferris, Clinton J. Green, Natasha Henry, Amrita Kaldher, Alanna McKnight, Adrienne Shadd, Christopher Stuart Taylor, David Vavala, Alykhan Visram. With Support From: Carlos Algondana, Shiemara Hogarth, Asif Mohammed, Rafael Slobodian, Ugochi Umeugo. The Augmented Reality Lab, York University, Toronto, Canada. Made possible with funding by: Social Sciences and Humanities Research Council (SSHRC) and the Canada Research Chair (CRC) Program. Community Partners: Essex County Black Historical Research Society; North American Black Historical Museum, Amherstburg; Windsor Public Library; NorthStar Community Centre at Windsor, Ontario; the Michigan Underground Railroad Network to Freedom; Detroit River International Historic Site Initiative; Nathaniel Dett Memorial Chapel and the Norval Johnson Library at Niagara Falls; Central Ontario Network for Black History; St. Catharines Museum; Salem Chapel, St. Catharines; Sandwich Baptist Church; Wellington County Historical Society; Black Pioneers of Wellington County; Buxton Museum and National Historic Site. For Sharing Documents and Photographs: Archives of Ontario; City of Toronto Archives; Library and Archives Canada; Marsh Historical Collection, Amherstburg; Diana Braithwaite and Family; Michael Mings, Murphy and Griffith Families, Shrewsbury; Carlos and Wendy Fergueson; Ross and Georgina Thompson; Wilma Morrison; Donna Ford; Lawrence Hall; Karolyn Smardz Frost. Special thanks to: Eva Salter, Regional Advisor, Ministry of Citizenship & Immigration, Ministry of Tourism, Culture and Sport; Naomi Norquay, Faculty of Education, York University; Archives of Ontario, City of Toronto Archives, Marsh Historical Collection; Future Cinema Lab at York University; to everyone who helped make this project possible... Including you! NASA's Spacecraft 3D is an augmented reality (AR) application that lets you learn about and interact with a variety of spacecraft that are used to explore our solar system, study Earth, and observe the universe. Using a printed AR Target and the camera on your mobile device, you can get up close with these robotic explorers, see how they move, and learn about the engineering feats used to expand our knowledge and understanding of space. Spacecraft 3D will be updated over time to include more of the amazing spacecraft that act as our robotic eyes on the earth, the solar system and beyond! Please look forward to interacting with even more iconic NASA missions in future updates! This app requires a camera. ARBasketball was featured in New & Noteworthy in more than 60 countries! You've been dreaming of playing basketball at the office. Now it's possible! Now everything you need to play basketball is your iPhone and a small piece of paper. 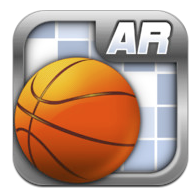 ARBasketball shows augmented reality technology at its best. Please note: for the best experience, you should use iPhone 3GS, iPhone 4, iPhone 4S, iPod Touch 4 or iPad 2. Follow us: twitter.com/augmentedpixels . More AR games are on the way! HP Aurasma is changing the way we interact with the world. Discover augmented reality experiences, create your own Auras, and share with friends. Bring photos, posters, birthday cards, and more to life. We can’t wait to see what you create!